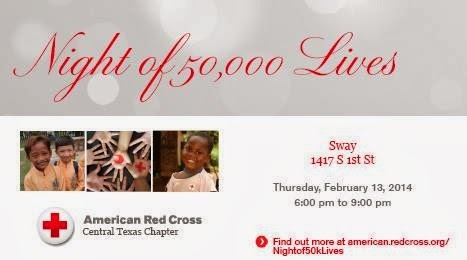 The Alice Kleberg Reynolds Foundation and the American Red Cross of Central Texas present the Night of 50,000 Lives, an exclusive dinner at Sway to benefit the Measles & Rubella Initiative on Thursday, February 13 from 6:00 to 9:00pm. Co-founded by the American Red Cross, the Measles & Rubella Initiative is one of the world’s most successful partnerships in global health – helping to control the spread of measles and to dramatically reduce mortality rates for these deadly diseases. Sway Executive Chef Alexis Chong will prepare and present a spectacular 5-course menu, featuring award-winning modern Thai cuisine and hand-selected beverage pairings. This exclusive evening offers 100 guests the opportunity to dine at one of Bon Appetit Magazine’s Top 50 New Restaurants of 2013 while supporting an international effort to eradicate measles by 2020. Tickets for the dinner are available here for $250 per person. With $1, you can vaccinate one child and save a life. Together, we can save 50,000 lives in one evening.